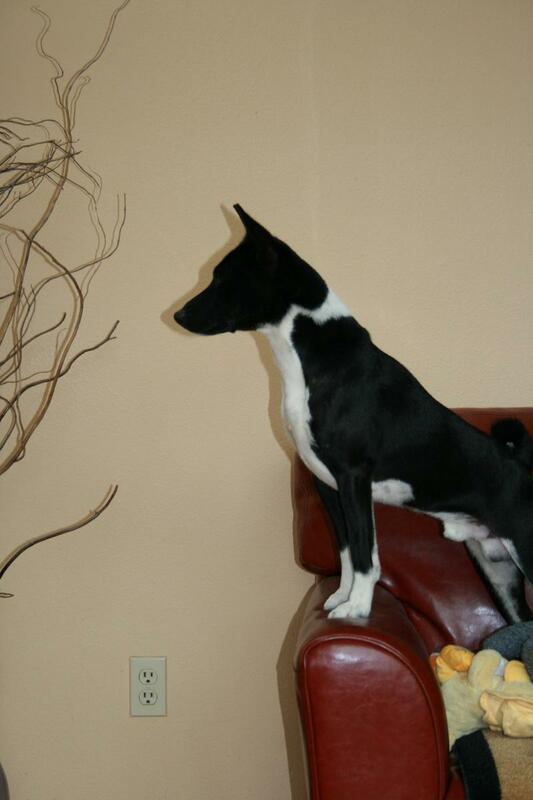 FoPaw's Basenjis - BISS Ch FoPaw's Royal Flush "Ace"
Today we said good bye to our boy Noodle. After two weeks of fighting with all he had, his heart and body just couldn’t go on any more. 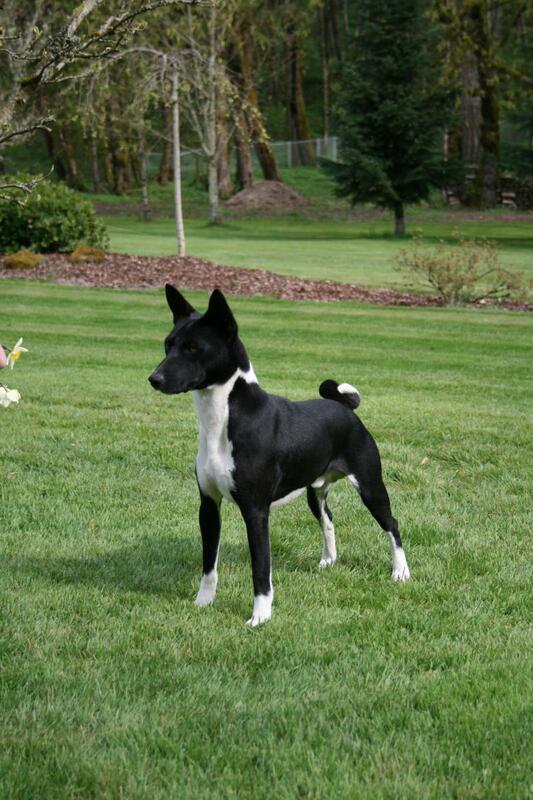 Noodle is known to most as Ace or BISS Ch FoPaw’s Royal Flush. He was finally diagnosed this past week as having a severe bacterial infection that was attacking his stomach and sadly had spread to his heart. Ace was attacked (last January) by a raccoon in our dog room after it came in through our dog door. We consider him a hero because he defended his home and other pack mates running the animal off leaving behind only a much wounded Ace and a ton of blood. During the first few weeks of his recovery he seemed a bit depressed and lacked energy, but we assumed the blood loss, trauma, and the fact he was quarantined from his dog family was enough to make any dog appear under the weather. Within a couple months our boy was back, minus half of an ear he seemed otherwise beautiful and full of life. He was playful and seemed to be gaining his confidence again. Then he suddenly seemed a bit under the weather. We again assumed he was still recovering and everything seemed to check out. But by June he was again worrying us by passing up his breakfast for a second day in a row. Blood work showed he was anemic and his thyroid was out of balance. We couldn’t get a clear read on it but the vet felt we should start medication. He also thought we would be wise to start him on prednisone in case AIHA was a concern after the blood loss, trauma and the fact he had been vaccinated for rabies by the vet he saw the day of the attack (our regular vet was out of town). At the time he was just about due for his three year rabies and we questioned it during a stressful time but were warned if the raccoon had rabies we should take the risk. Now we were concerned it was an auto immune issue. Within a couple days of treatment he began to have severe stomach pain, after another vet check we were about to schedule an appointment with an internal medicine vet when we discovered Ace had been chewing on his kennel, it was zinc and the powder coating was chewed away. Treatment for zinc toxicity and some antibiotics to be safe from infection and he turned around. Two weeks ago out of the blue our healthy happy boy showed signs of bleeding in his mouth, no other symptoms lead us to believe he had broken a tooth or ruptured an abscess. A soft diet and some antibiotics until our vet was available seemed a reasonable course. We thought our poor boy had just had a really unlucky year. By the third day of bleeding we became worried and ran him to the emergency vet, he had not showed any signs of bleeding anywhere else and was eating and acting normal. When we arrived at the vet office he had blood in his urine. They felt he had AIHA and was bleeding out because his immune system was attacking his blood causing it to thin. They began him on stomach meds and 80mg of prednisone. We questioned twice that large a dose but we were reminded he was critically ill with a hematocrit of 20 at this point. Within three days he had diarrhea and was getting sicker when we went back to the treating emergency vet. At this point we were told treating with antibiotics should be the next step on top of everything else and at this point his hematocrit was 16. After the first dose he began to vomit, we couldn’t stop it or the diarrhea. Within a couple days we returned to be told his hematocrit had dropped to 13 and he was getting weaker. This was 3:30am on Monday morning and we were losing confidence in the emergency clinic and trauma vet. We called our vet at 8am and took Ace there. On the way we said our good bye to Ace and expected to come home without or sweet boy. My vet was not convinced; he said he couldn’t end Ace’s life until he knew he was done fighting. After further testing he found Ace did not have AIHA, in fact he was making blood as fast as his body would allow and his white cell count was elevated. He believed Ace was fighting a chronic systemic infection. He stopped the meds and started IV fluids and IV antibiotics hospitalizing him overnight to see how Ace would do, at this point Ace’s hematocrit was 11.6. We were warned he may not make it through the night. Tuesday morning we headed to the clinic to see our boy, on the way we called to find out how he did and were thrilled to hear he would be waiting for us for a morning walk. He had bounce in his step and was clearly glad to see us. Our vet felt he needed more IV fluids and meds but encouraged us to head across town to an internal medicine specialist to discuss what to do next. After review of Ace’s records and examine he explained, Ace had met the perfect storm. He likely contracted an infection from the mouth of a dirty raccoon and his immune system was compromised already from the attack as well as being severly anemic from blood loss. He managed to fight it off but it only went dormant leading to symptoms that confused us as time went on. Each time he got sick the vet treated with antibiotics but none were long enough or strong enough to kill this type of bacterial infection. This last time it came back at his stomach attacking an area and eating into the lining of his stomach. The bleeding triggered an immune system reaction causing anemia which weakened his heart and likely allowed the infection to reach his heart. We were warned even if he got better he may not make it. Heart failure may be in his near future. The specialist also believed it is possible the infection reached his heart just after the attack while he was anemic and in the past months his heart has been struggling with the infection causing damage to the heart itself. We opted to work with the vets and bring Ace home to treat, Kevin got lessons in subcutaneous fluids and strong doses of IV antibiotics. Ace was on no food or water for the first two days but by the time we left our vet on Tuesday his hematocrit was 17. We were walking on clouds. Our hope was that the infection had stopped at his stomach and we could turn him around. By Thanksgiving he had his first meal of yogurt that morning and by dinner he was begging and had a few tiny pieces of white meat turkey. He picked toys out of our toy basket and played lying on our sofa. He seemed so happy to be home, it was a wonderful day for all three of us. The following morning at 3am Ace seemed weak and by 8am he was unable to stand. We drove to the vet and on the way he showed signs of heart failure, we got there to be told his heart was in shock. It appears the infection had reached his heart we just aren't sure when. The only way to keep him comfortable was with oxygen and we were told he would not survive. We held him and kept him calm saying good bye for the final time. We told Ace he was our very special boy, we always said we bred every litter from our start to get him. He was all we ever wanted in a dog; he was a joy to live with and has left a huge empty space here. We aren’t yet sure how we will ever recover from the loss of a boy like Ace, our hearts ache and we will forever miss our Noodle. I wrote this explanation for all of Ace’s kids, brothers, sisters and cousins so people would know exactly what happened to him. Over the past several months Ace saw 7 different vets and specialist, we were assured by all of them his kids and other relatives have nothing to be concerned with. Ace had no signs of any type of genetic disorder. Please think of him and hug your basenji kids, let them steal food off the kitchen counter and hog the bed tonight in his name.